Pay in person or online by clicking the orange button below. Boost your quality of life with skilled body awareness and mindful movement strategies. These unique classes listed below have been constructed by a Massage Therapist specializing in pain and movement and martial arts instructor. Combining a mix of extraordinarily simple yet effective skills for people of all walks of life and all talents. The goal of the class is to provide you with resourceful knowledge and restorative movement to help yourselves improve how you feel and perform in your daily lives. Studies show that improving your movement quality, posture, balance, breathing, function, and performance will help relieve your stress, tension, achy joints and soft tissues and will add years to your life and quality to your years. You can combat many common problems with the skills introduced in these classes. Because of the teachers unique training background, most of the concepts behind these skills are from outside of the box or slightly tweaking the most common strategies for better results. Learn with an open mind. Welcome the process. Explore and restore your body. These skills can be used for the rest of your life. Learn things that most doctors, therapists, and other wellness pros won't tell you. It's like a combination of some Fountain of Youth Wisdom and a First Aid Kit for improving your aches, pains, stiffness, and stress. Help your system to reset before and after activities. Class is for mature teens all the way up to seniors, elite athletes to couch potatoes. If you can move at least fairly well or better and get on/off the floor you can participate in all classes. If you have limitations, please inquire to see if any of the classes could still help you. Improving balance and mobility. 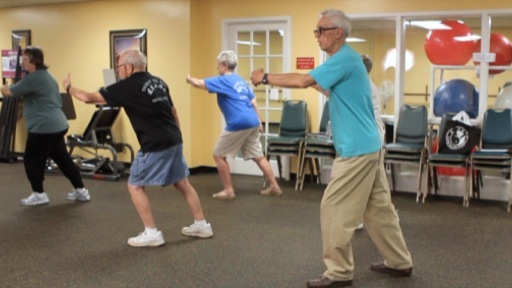 Good for anyone, including seniors, to reduce fall risk. I’ll show you some of the things that I do to help myself and for some of my clients. You will be active and moving barefoot letting your body and brain indulge in the learning process while also improving balance, performance, and function. No tools are needed for any of the classes. Used in 30 Day Challenge to reduce symptoms of TENSION, ANXIETY, and STRESS. *After you purchase this video you will get a private YouTube Link to the playlist via email within 24 hours. (A must for everyone from couch potatoes to performance athletes) Simple, fast, & effective lessons for Stress/Tension/Achiness Relief, Breath work, and Posture (Movement & Static) 75 minutes. These practices are so simple you might not believe how effective they can be until you pay attention and feel the changes in real time and the benefits are accumulative to improve more and more with time. (A must for MOST people) This video playlist gives you a full series of movements that can be used to help most of the whole body in a very specific and efficient way. Each movement is broken down into separate videos to give you the nitty gritty details in all the movements that make them unique to get the most bang for your buck. You also get a video of the whole series flowing from one movement to the next all the way through. In good time, with some practice, many people will likely be able to do the whole flow in under 10 minutes without using the videos. Try doing the whole flow every day, even if you haven't mastered the details and you can fill in the details as you practice. Observe over time how you may be feeling throughout the days and you might notice that you’re not feeling as slumped in your shoulders and neck or maybe less aches and pains than usual. You may feel that you are moving better or more stable in things that you do. Letting Go: from students: More relaxed, back feels better, pain in left shoulder has ceased, less pain in knees and back, less stiff, achiness gone and most places, felt better posture, more stable, better self-awareness, better body mechanics, less tension and tightness, upper body more relaxed, less pain in hips, help lower back, felt taller, breathing better, feeling good, less stiff. Usually when sitting in a car for long trips her glute and leg both bother her a lot. This past weekend she went on a road trip to see her grandbaby and she utilized the information that she learned in class #1 and she said she had almost no bother at all in her glute and zero discomfort in her leg. This is awesome!! She didn't need to use any tools. Just some good effective knowledge from class to play with in her body. And she still has 6 more classes of great knowledge bombs to learn more. Check In With Your Body - Move Your Bones: Student said "Today's class alone was worth the price of all the classes!" Other students said: Feeling good overall, feel more relaxed and stretched, more balanced on feet, started out locked up before class but during class had more mobility and movement, feel more aligned, weight distribution more neutral, more loose, less stiff and more range of motion, feel good, neck loose, less sciatic pain. Student with fibromyalgia said "I wasn't going to come to class tonight because I was so achy, but I'm glad I did because now I feel so much better." Warm Up - Reset: better all over, less stiff, more loose, back feeling good, more relaxed, more in alignment, fun, shoulders and neck looser, nice lengthening through hamstrings and inner thigh, right side of neck feels better, upper body feels much better, posture feels better overall, always feel better after I do the class, back feels less tension, knees feel better, ankles feel better and more mobile, standing taller and feel more balanced. "I really enjoyed this. I felt that there was a lot of awesome information given. I feel bad that I missed some of the class participation because of my injury and having to have surgery, but as soon as my doctor clears me I'm going to get back into it again. Thanks for the awesome classes." The things she learned in class are likely going to help her with her recovery. A word that is inspiring me currently is the word "practice". It's a simple word that fills a gap in the void that I couldn't put my finger on when thinking of the Mind, Body, & Movement classes that I've been making available this year. I'll come back to that in just a moment. Most of the things we do we are basically working in a template. We learn how to work within that template and from there we, for the most part, go on autopilot and let ourselves get distant from what we are actually doing. Not paying as close attention to it. Whatever we are doing we are getting better at and if that is going on autopilot to fill the templates in our life, that is what we'll get better at. We also are consumers, on auto pilot. We buy a product, a service, an experience and then we move on to the next thing simply being content that we made the purchase and experienced it. How long do things serve us in a good way as consumers working in templates on autopilot? Back to my Mind, Body, & Movement classes. I've taken hours upon hours of my own training, knowledge, practice, and experience and pulled out simple and effective things to help people to cultivate feeling better in their own life. Not a class that makes all the changes during class or even after a week of practicing. The lessons are kind of templates of their own that give your brain and body an experience that it can learn and grow from each time that you practice it and will carry over into your other life templates. The benefits are cumulative and need practice to feel, observe, notice, and cultivate the benefits. If you never have good breathing practice, how can you notice when you're breathing is rapid or shallow or maybe holding your breath in your daily life? How will you change it? If you're always holding tension and don't recognize where or what to do, how can you change it in that very moment? If you never experience side flexing your spine to the right in an efficient manner, how will your brain and body ever recognize that it is a helpful option to incorporate when moving all other joints in your body through your daily life? If you never play on the floor anymore, how well will you be able to get off the floor if you fall? Or how well will your brain and body respond to prevent a fall if you never practice within a safe and effective template so you are better prepared before it happens? The lessons I teach will only go so far if you only buy it, participate in class 1 time, then never do it again. If I give you a bottle of water and you take it home and put it on the shelf as something you received from me, you will never get the life-sustaining benefit of what is inside the bottle. These lessons can be played with, adjusted for your circumstances, experienced in your body cultivating many benefits over your whole life. They just happened to be taught in a very simplified fashion to make it easier to digest. To understand it better you must practice. Practice at home and even watch the classes over again to become more proficient. Learn, experience, and you will grow and develop.